Add the iSP6X to your account to receive email notifications about software/firmware updates and more. What Android version is required for the SmartPlug? What are the SmartPlug's Specifications? 120VAC, 15A, 60Hz, 1800W Indoor use only Compatible with 2.4 GHz network. Compatible with (Personal Wi-Fi networks). The LED indicator should flash Red/Green. The LED indicator will turn off briefly. The LED indicator will quickly flash Green. You may release the button at this point. How do I know if my mobile device is connected to my home network? For Apple Devices: Tap on the Settings icon. The Wi-Fi icon should display the name of your home network next to it. If it is not shown, tap on the Wi-Fi icon. Your Apple device will search for networks in the vicinity. Select your home network. Once your home network is displayed, you may exit Settings. How to delete the Smart Device from the iHome Control App? *Note: The "Hide" option removes the SmartPlug from the user's account. However, the SmartPlug(s) still exists in the cloud. This allows other registered users in the household to continue using the SmartPlug(s). Select (i) next to the Device you want to remove. Scroll down and select "Remove Device" button. Note: We recommend resetting the Smartplug to remove it from your account. How to name my Home? The iHome Control App will ask you to name your home. In other words, name the Wi-Fi network inside your home. Examples: Jane’s Home; John’s Apartment. How to setup a Room? You can setup 1 or more SmartPlugs in a room (iOS only). Examples: bedroom, dining room, living room, kitchen, etc. You can control all SmartPlugs simultaneously in each designated room. Open the iHome Control App. Select the “Home” icon at the bottom of the screen. You should see “Kitchen” listed under the rooms category. How to setup a Zone? You can setup multiple zones in your home (iOS only). For example; you may setup a zone in the ground floor of your home and another zone in the 2nd floor. You can control all SmartPlugs simultaneously in each designated zone. You should see “Ground Floor” listed under the Zones category. How to add a Scene? A scene can be set for a combination of SmartPlugs in different rooms or zones (iOS only). For example; you may develop a Scene for the “Holiday Season.” You may have a combination of decorative lights in multiple zones or rooms that you want illuminated at night. You can control all SmartPlugs simultaneously in each designated Scene. Select the “Scenes” icon at the bottom of the screen. Select “Label” and enter the Scene name (ex. Holiday Season). Optional - select “Choose a New Image” if you want to add an image. Otherwise, skip to step 7. Select “Add Device” to add SmartPlugs that will be part of your Scene. Select “Done” to complete the process. Which devices can be used to share a SmartPlug(s)? How to set a Rule? Tap “Devices” at the button of the screen. Tap (i) next to the Smartplug you want to create the rule for. Under RULES, Tap (+) Add rule. Enter the name you would like to call the rule (i.e. Fan Timer). Tap “Starts” - this is the time you would like the device to turn ON, make sure to select AM or PM. Tap “End” - this is the time you would like the device to turn OFF, make sure to select AM or PM. If you would like the device to never turn “OFF,” activate the “Never End” feature "ON". Otherwise, skip this step. Tap “Done” on the top right of the app screen to complete the setup. How many rules can I create for one plug? You can setup a maximum of 7 rules per plug. Where can I download the iHome Control App? Where can I find the Accessory Setup Code? The Accessory Setup Code can be found in your Quick Start Guide and on the Smart device itself. What iOS version is required for the SmartPlug? What is the Cloud's storage capability? The Cloud does not have any storage limitations. Think of a rule as a timer. For example; you can set a rule to turn a lamp ON at 8:00PM and OFF at 6:00AM the following day. What's the difference between iSP6 and iSP6X? iSP6X is not remote control compatible (It does not have remote control sensor). Can I control my SmartPlug using Android voice commands? Voice control is not available for Android devices. Can I use Siri to control a SmartPlug? Yes. Use keywords such as the designated "room" name and the word "outlet." Can I setup zones, rooms, and scenes using my Android device? The options to set zones, rooms, and scenes are available for iOS devices only. Android users can control individual SmartPlugs. 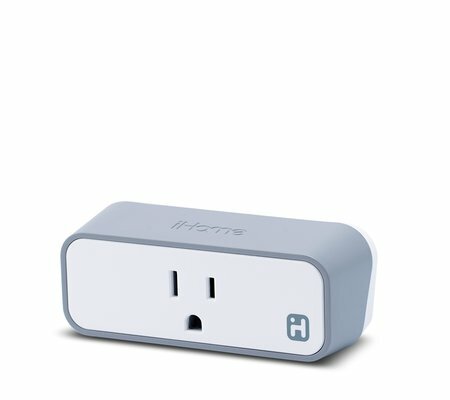 Can I download the iHome Control App to my computer for use with my SmartPlug(s)? The SmartPlug is designed to work with mobile devices only; not Mac’s or PC’s. Can I connect my SmartPlug at work or in my dorm room? The SmartPlug is designed to function within personal Wi-Fi networks. It is not compatible with Enterprise Wi-Fi Networks such as in colleges or businesses. What can I control with the SmartPlug? You can control lamps, fans, humidifiers, or any appliance meeting the SmartPlug's specifications (120VAC, 15A, 60Hz, 1800W). How many SmartPlugs can I connect to my home network? There are no quantity restrictions. It depends on your Wi-Fi Network capabilities and you can connect as many SmartPlugs as you want! Can I connect my SmartPlug to an enterprise network; example: business or college dorm? No. SmartPlugs are designed for home networks only.